Jon Magnus Jonson was an American sculptor of Icelandic ancestry. He was born on December 18, 1893 near Upham, North Dakota to Icelandic immigrant parents, Stefan Jonson and Homfridur Hjaltalin. Early in his life Jonson showed a strong passion for the arts. He spent his school years in the city of Fargo and then at the Minneapolis school of Art. After he served in the army during World War I, he came to Chicago to work as an assistant at the Lorado Taft Midway Studios and to study under Albin Polasek at the School of the Art Institute. Seeking more challenges in his field, Jonson travelled to New York, where he attended The Beaux–Arts Institute of Design. Upon his return to Chicago, the University of Chicago commissioned him to make some of his most prominent sculptural works, including the tympanium over the door of the Oriental Institute Museum and the International House Fountain. 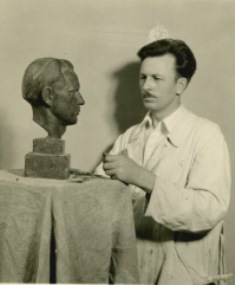 In 1944, Jon joined the faculty at Cranbook Academy of Art in Bloomfield, Michigan, after being invited to teach sculpture there under noted Swedish sculptor Carl Milles. Jonson stayed in this position until his untimely death of a heart attack in 1947. Over the course of his life, Jonson received several awards in recognition of his contributions to creative arts. These included the Tiffany Foundation Award in 1927, the garden sculpture prize at the Hoosier Salon in 1931, the prize of Merit for his marble sculpture Mother and child, in 1936, and the first sculpture prize given by the Indianapolis Art Association at the John Herron Art Institute in 1937. According to his students in Cranbrook Academy, Jonson was a dedicated teacher who devoted all his time to his students and showed a passion for life, fullness, and seeking knowledge and perfection in his discipline. He carved most of his sculptures directly on the medium without previous designs or models, a rare feature borrowed from great old masters.